The Washington Capitals are off to a nice start toward securing back-to-back Stanley Cup championships but are short underdogs at Carolina in Game 3 on Monday. 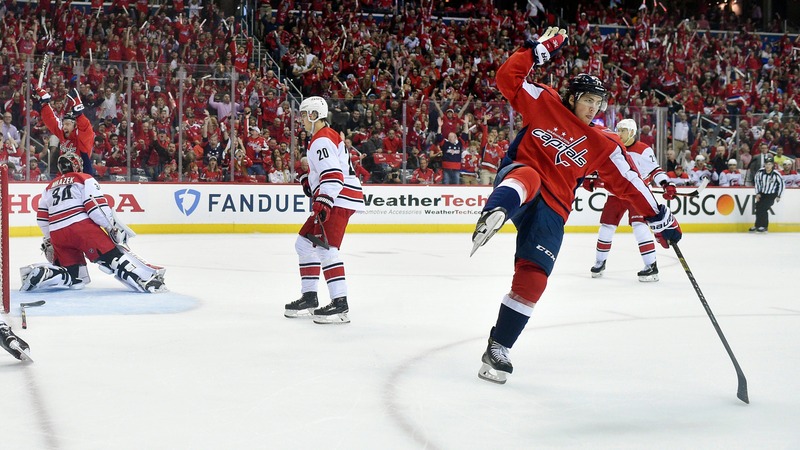 After winning their first Stanley Cup in team history, the Washington Capitals are off to a [nice start](https://www.washingtonpost.com/sports/capitals/capitals-take-2-0-lead-into-game-3-against-the-hurricanes/2019/04/14/88de45f8-5ee8-11e9-bf24) toward securing back-to-back championships. Washington has a 2-0 lead over the Carolina Hurricanes in the first round of the 2019 Stanley Cup Playoffs. Washington opened a -145 favorite to win the series at the Westgate SuperBook, while Carolina was +125. Washington is now -500 to win the series; Carolina is +700. The Capitals won Games 1 (4-2) and Game 2 (4-3) and are now +650 to win the Cup, with the second round in sight. They're priced as +110 underdogs to win again Monday (6 p.m. CT) against the Hurricanes (-130), with a total of 6 goals (UNDER -115), per most Las Vegas oddsboards. Washington ended the regular season up and down for bettors, dropping six of its final 13 games -- three as a favorite, three as a dog. But the Caps took care of business in this series' first two games, both as -155 favorites, without trailing for a single minute. The defending champs raced out to a 3-0 lead in Game 1, but Saturday's win took overtime for Washington, which survived thanks to defenseman Brooks Orpik's fourth goal in 151 career playoff games. Both games in D.C. went OVER 5.5 goals. The Hurricanes return home looking for their first playoff win since 2009, when they fell 4-0 to the Penguins in the conference finals. Carolina overcome an 0-2 series deficit in the first round against Montreal in 2006, which sparked the Hurricanes' lone championship run. __MORE:__ [Our complete Stanley Cup Playoff betting coverage, including past picks](https://www.betchicago.com/nhl-betting) The other three series in play Monday are [all tied at 1-1](https://www.betchicago.com/nhl-stanley-cup-playoff-series-odds-knights-sharks-2019). Series favorites Nashville and Boston both lost in Game 1 before winning Game 2. Underdog Colorado evened its series at 1-1 on Saturday. Toronto (-120) hosts Boston (+100) at 6 p.m. on Monday, with a total of 6 (UNDER -120). The first two games of the series both stayed UNDER 6 goals, with the teams trading 4-1 wins. After stealing home-ice advantage, the Maple Leafs are now even-money to win their first series since 2013, per updated series prices at the Westgate, with the Bruins the short -120 favorites. Dallas (+110) hosts Nashville (-120) at 8:30 p.m. on Monday (total of 5) as the short underdog after the Preds knotted the series at 1-1 on Saturday. Both games have been one-goal margins (3-2, 2-1). The Predators are -120 favorites to win the series, with Dallas at even-money. Monday's nightcap (9 p.m.) features Calgary (-125) traveling to Colorado (+115) with the series tied at 1-1. Monday's total is 6, with both previous games falling UNDER that mark. The Flames were prohibitive series favorites are are still -220 to win, even with the Avalanche (+180) taking one of two on the road. __PLAY:__ Our [free daily contests](https://betchicago.chalkline.com/), including [NHL Pick 6 Playoff Challenge](https://betchicago.chalkline.com/games/nhl-pick-6-playoff-challenge), for the chance to win a BetChicago prize pack.